Spotted hyena cubs of high-ranking mothers have a lower probability of infection with and are more likely to die from canine distemper virus (CDV) than cubs of low-ranking mothers. In subadults and adults, the picture is reversed – high-ranking females exhibit a higher infection probability than low-ranking females whereas mortality was similar for both groups. These are the surprising and interesting results of a long-term study conducted by scientists at the German Leibniz Institute for Zoo and Wildlife Research (IZW) who investigated how social status and age influence the risk of infection with CDV and its consequences for survival. They have just been published in the scientific journal "Functional Ecology". Epidemics of infectious and contagious diseases spread through contact or proximity in social species, including humans. Spotted hyenas are highly social animals that live in socially structured clans and have strict dominance hierarchies. Mothers keep their offspring together in the clan's communal den, akin to human schools and kindergartens in which diseases can easily spread. In 1993 / 1994 an epidemic of canine distemper virus swept through the Serengeti ecosystem in Tanzania and Kenya. The epidemic was caused by a novel, virulent CDV strain which was well adapted to spotted hyenas and other non-canid carnivores. During this epidemic, communal dens of hyenas were hotspots of CDV infection, and many juveniles were observed who either showed clinical symptoms of being infected with CDV or died from CDV. 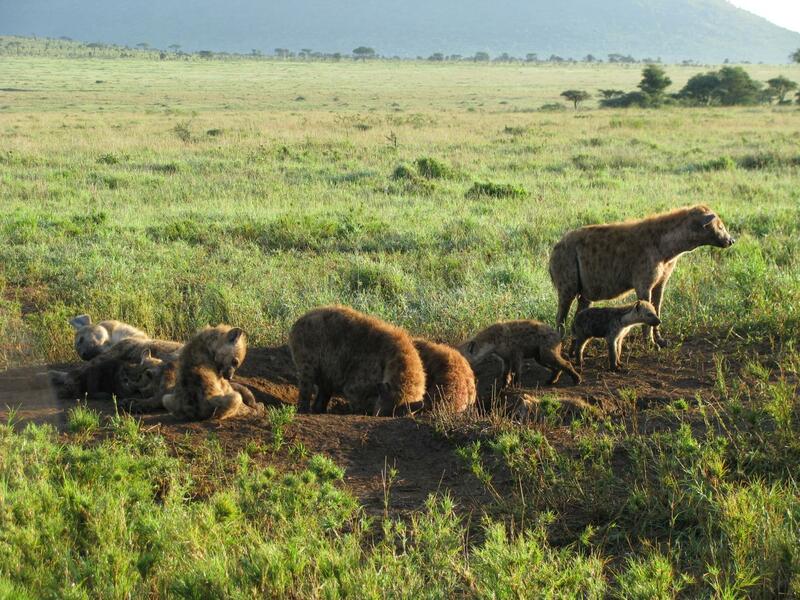 The scientists used two decades of detailed demographic, social and infection data from individually recognized hyenas in three clans in the Serengeti National Park in Tanzania. "We followed 625 females and 816 males in total. In this long-term study we monitored their health status by recording the start and end of clinical signs of CDV and by collecting hundreds of samples, mainly saliva and faecal samples from known individuals to screen for the presence of CDV", says Dr Sarah Benhaiem, scientist at the Leibniz-IZW. The results illustrate that two different mechanisms drive infection patterns among cubs and older animals. Cubs from high-ranking mothers were less likely to be infected and, once infected, less likely to die than cubs from low-ranking mothers. These cubs of high-ranking mothers were nursed more frequently than those of low-ranking mothers and therefore could allocate more energy to immune processes. This reduced their risk of disease, improved their immunocompetence and thus reduced subsequent mortality. In contrast, high-ranking subadults and adult females were more likely to be infected than low-ranking ones, reflecting the more intense social life of high-ranking individuals. This increased chance of infection did not result in an increase in adult mortality, however, because, in contrast to cubs and subadults, adult hyenas rarely die from CDV. In many mammalian societies, such as baboons and spotted hyenas, high-ranking individuals have more social interactions with other members of their group. Elevated social contacts directly increase the risk of infection during an epidemic. This study shows for the first time that a high social status can mitigate the negative impact of a pathogen on mortality in younger age classes whereas a low social rank can hinder its transmission among subadults and adults in a free-ranging group-living mammal. "It would be interesting to investigate the impact of this epidemic at the population level, and to assess how high-ranking and low-ranking individuals contributed to the possible recovery of the Serengeti spotted hyena population", says Dr Marion East, one of the senior authors of the study. "To our knowledge, our study is the first to disentangle the importance of social processes for individual exposure and resource allocation to immune processes in a wildlife population", says Dr Lucile Marescot, scientist at the Leibniz-IZW.